Decca Records began as a British record label established in 1929 by Edward Lewis. 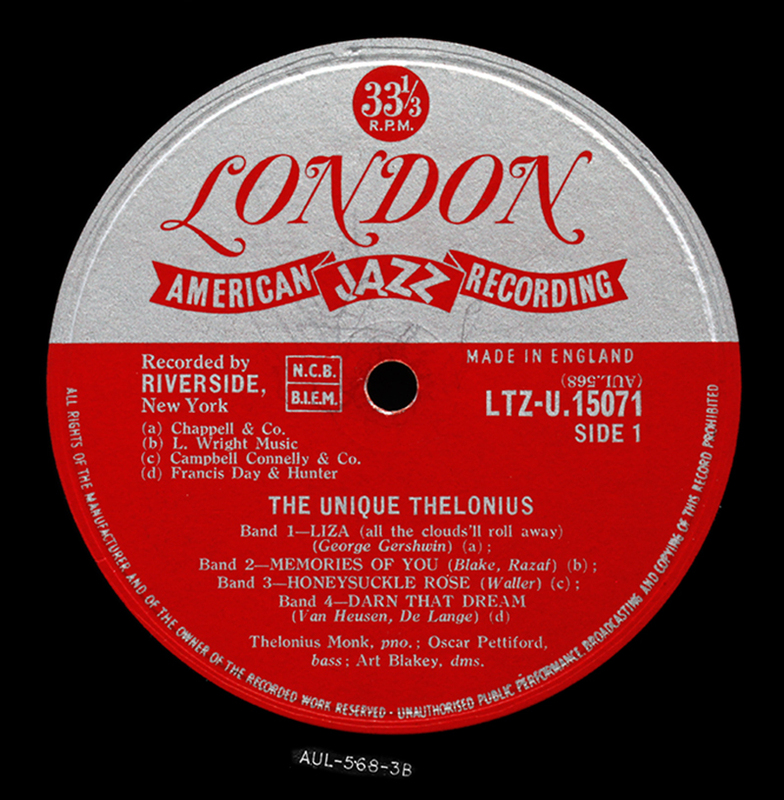 Its U.S. label was established in late 1934; however the two Deccas remained autonomous companies until American Decca’s parent company bought British Decca’s parent company in 1998. 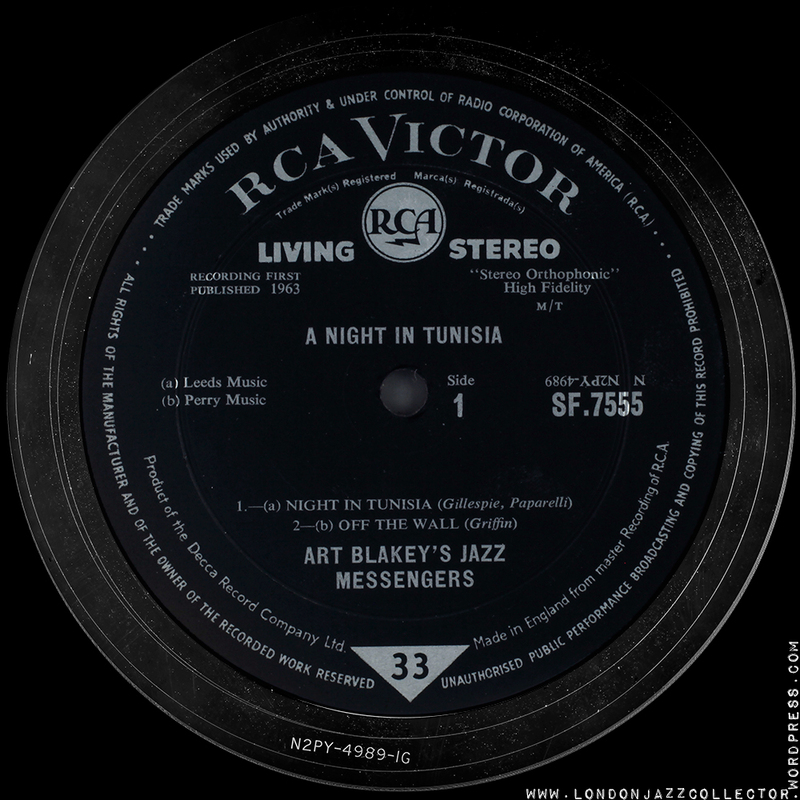 In the intervening years, separate vehicles had to be found to release American recordings in the UK, and British recordings in the US, whilst each was unable to use the Decca name in the others country. Pretty silly really, but not compared with the folly that followed, with everybody scrambling to buy up everybody else, until only two or three companies owned everything. 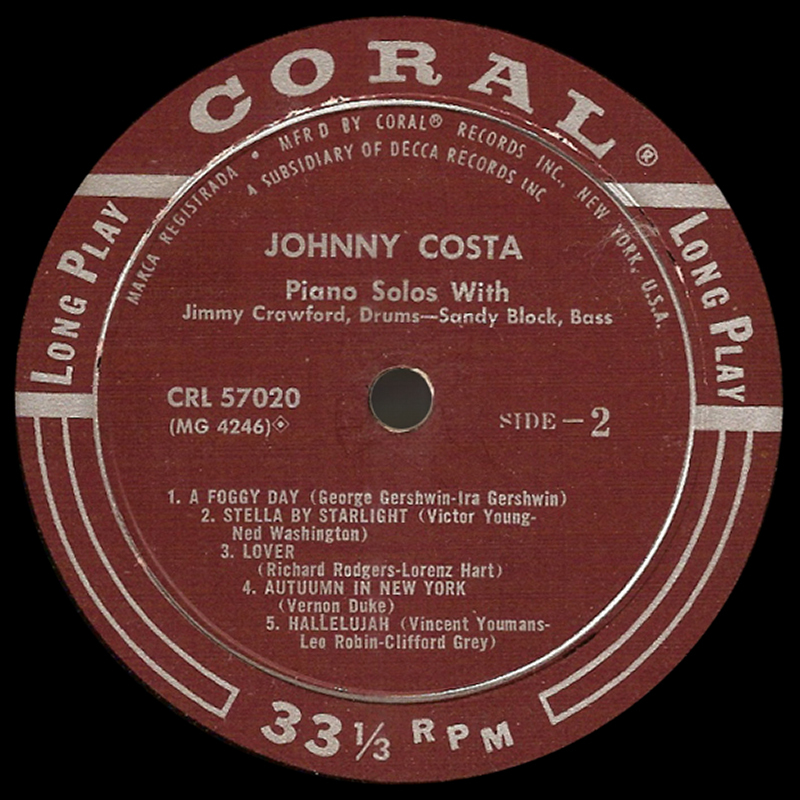 Decca was renowned for its development of recording methods, while the American company developed the concept of cast albums in the musical genre. Both wings are now part of the Universal Music Group which is owned by Vivendi, a media conglomerate headquartered in France. 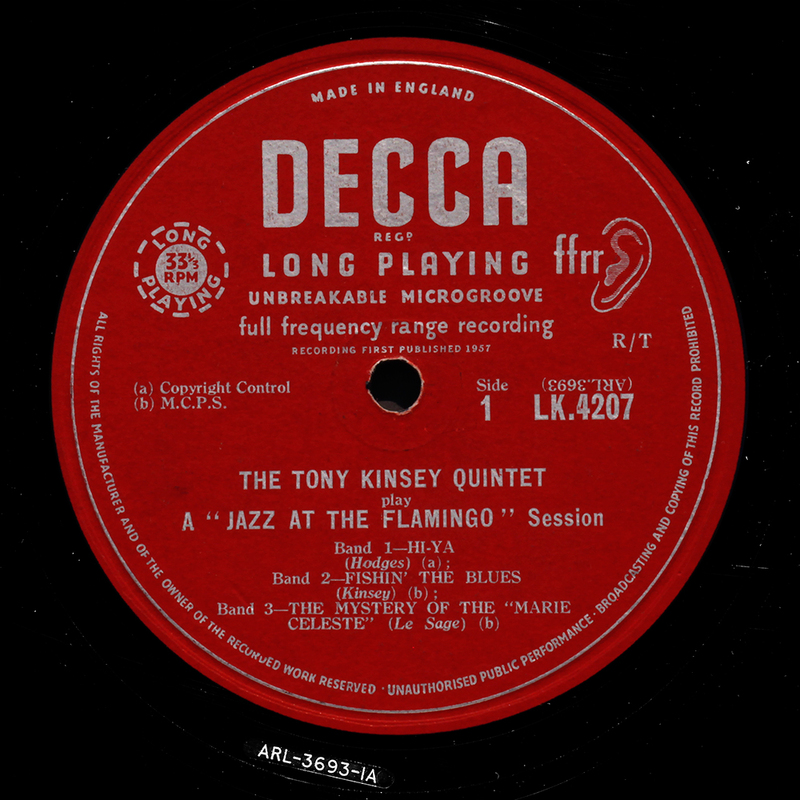 Decca is synonymous with the early years output of the Rolling Stones (documented in obsessive detail elsewhere), a vast catalogue of classical music, pop, country and folk, but very little jazz, such that wiki overlooks the category altogether. 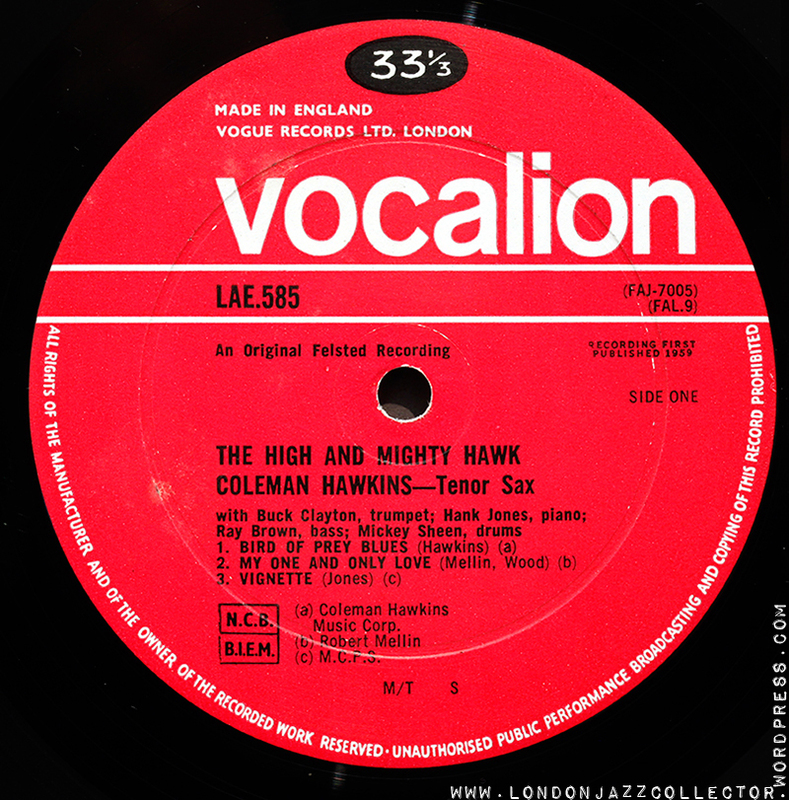 There is a very small selection of jazz releases under the UK Decca name, more pressed by Decca for associated sub-labels including the UK London label. Fortunately, Decca also pressed a very large proportion of the releases of early Riverside, Contemporary Vogue, and Esquire among others, so their legendary engineering skills were put to good use. 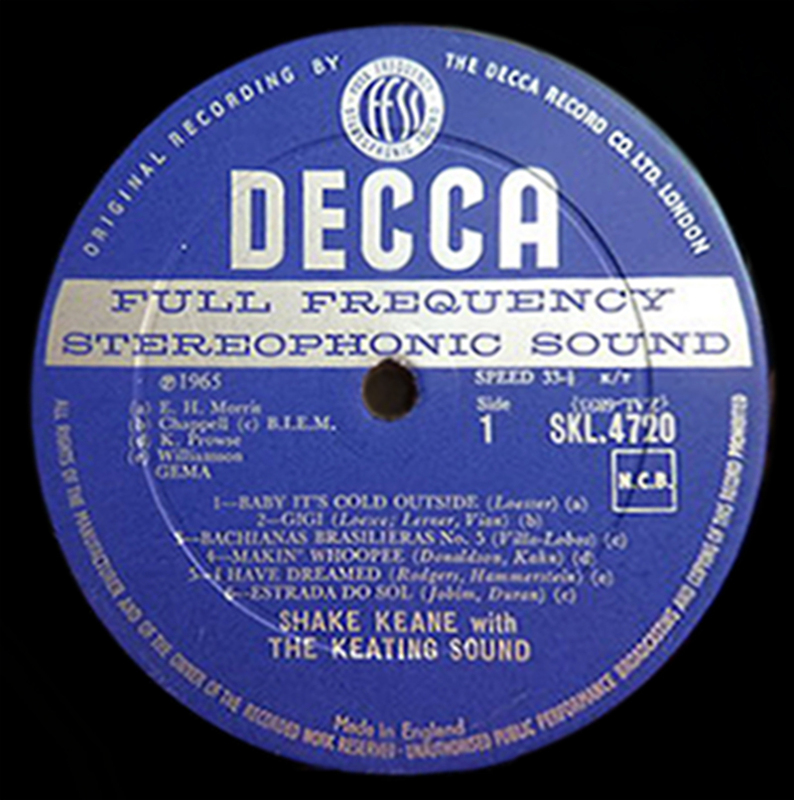 A labelography of Rolling Stones releases on Decca indicates nine variations exist of the basic Decca label design above, this one distinguished by the top of label text reading simply “MADE IN ENGLAND”, which would later be expanded by the words “MADE IN ENGLAND . 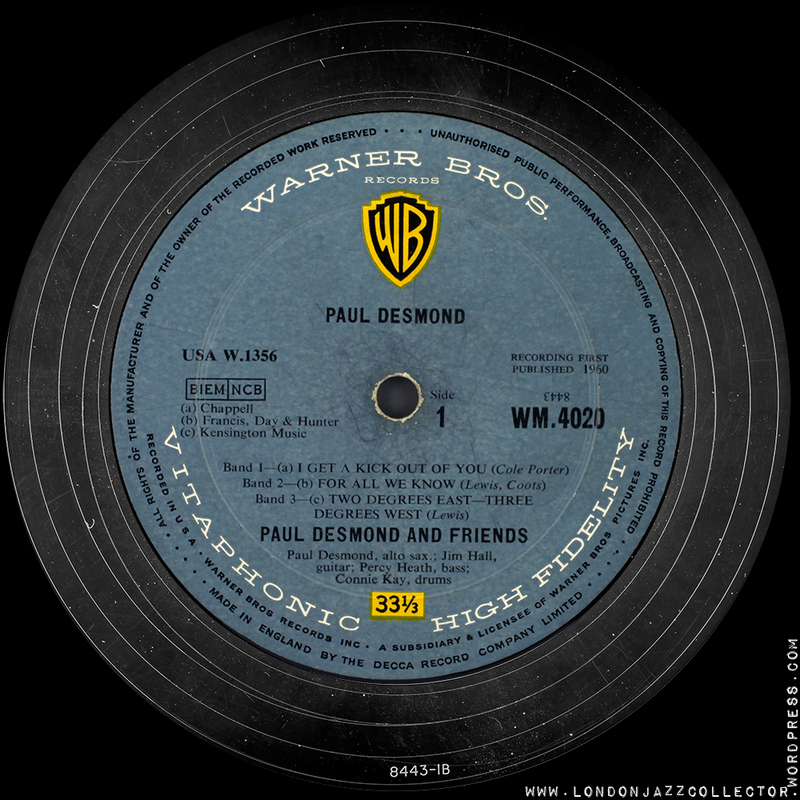 THE DECCA RECORD CO. LTD.” Other differences relate to where on the label the year of publishing appears: above the centre hole, left of the centre hole, or at the bottom centre of the label. You have to despair at admire this level of attention to detail. 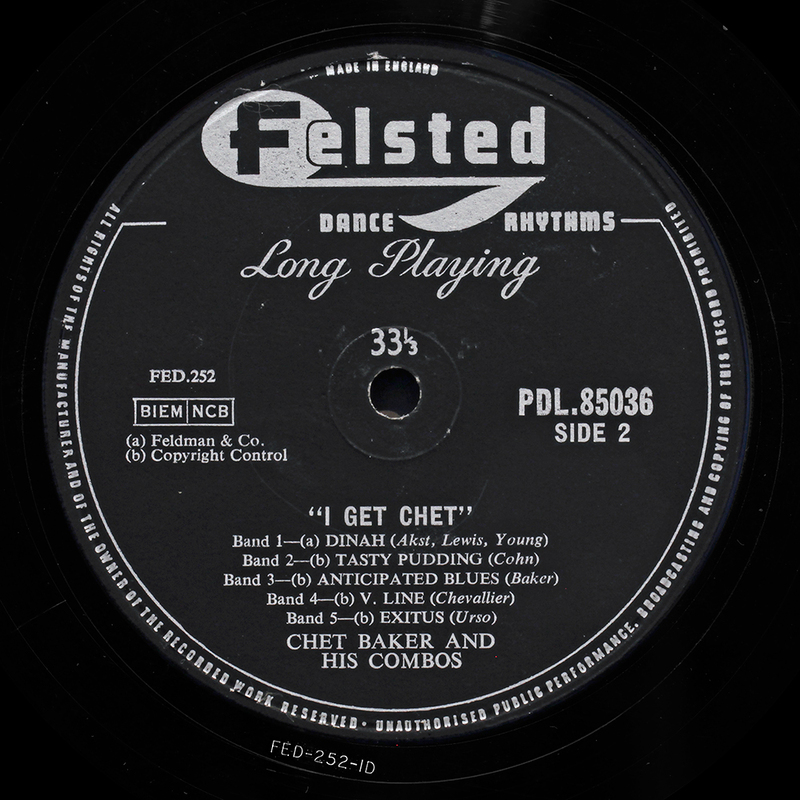 Felsted Records began as a subsidiary of the UK Decca Records in July 1954 with music mainly in the jazz and dance band genres. 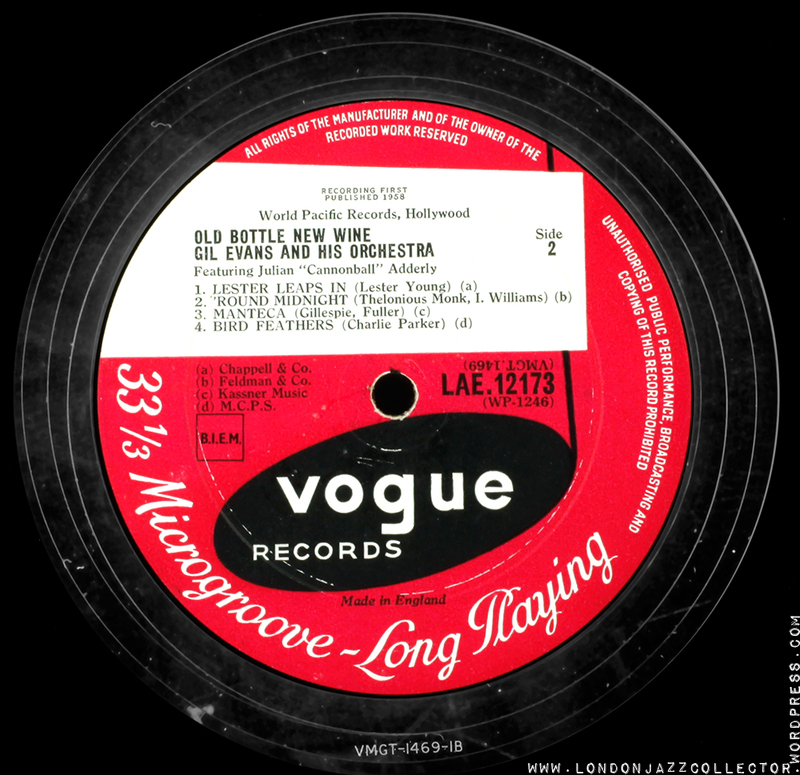 The label took its name from the village where Sir Edward Lewis, the head of UK Decca, lived. Late in 1957, Felsted Records US opened in the USA operating from London Records’ office in New York and in 1958 Felsted was reinstated in the UK leasing US material contracted through its US office. 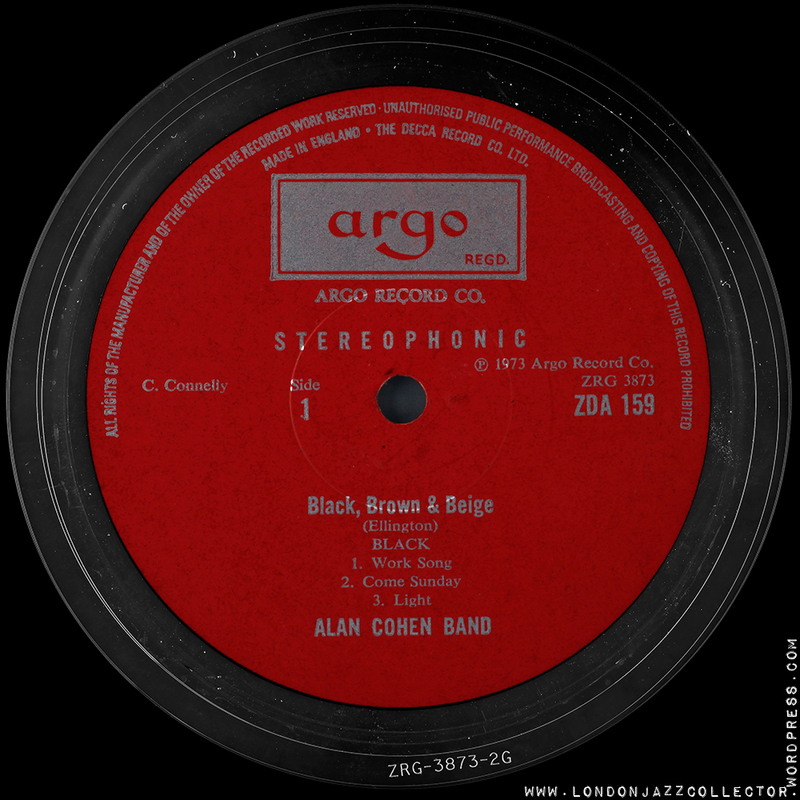 Neither labels had much commercial success: the UK label was closed in 1960 and its roster transferred to London Records. 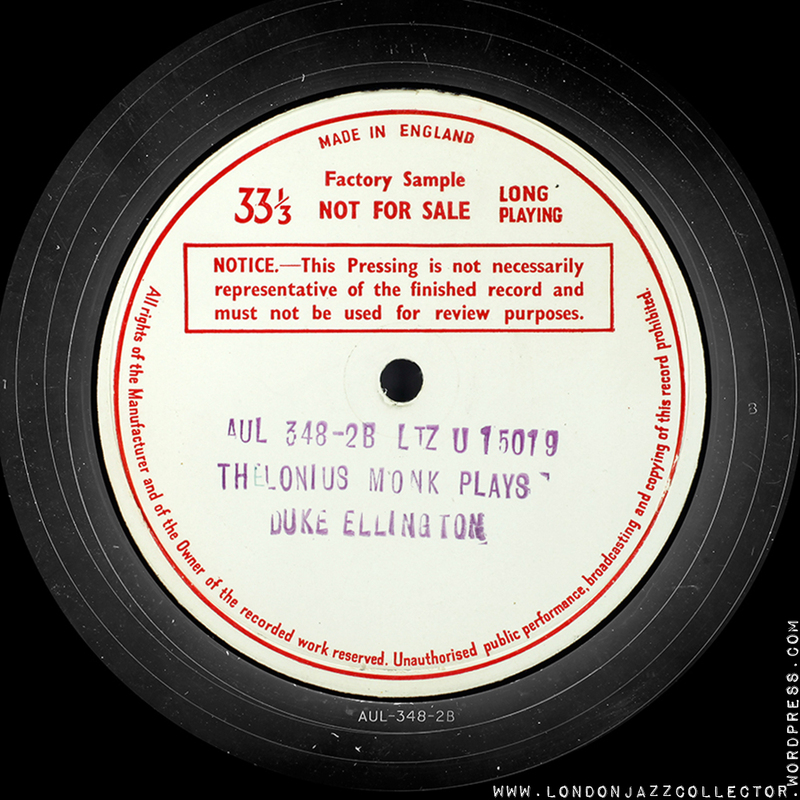 Short-lived UK jazz label – given its own page here on LJC. 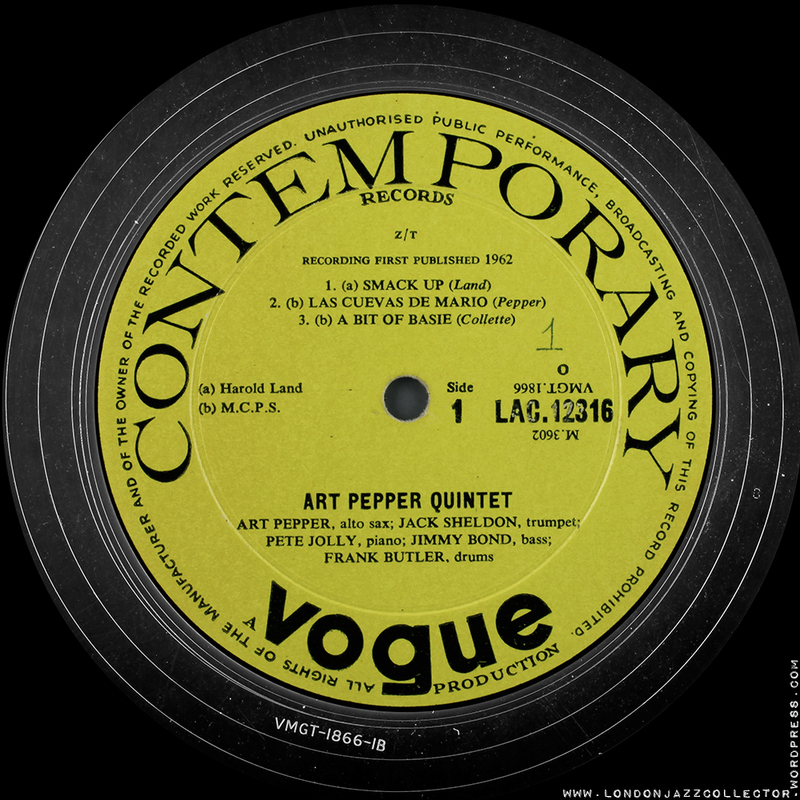 British label Vogue acquired the Tempo catalogue and Vogue was in turn acquired by Decca under Tony Hall, who used it to issue British modern jazz recordings until it discarded the label in 1961. 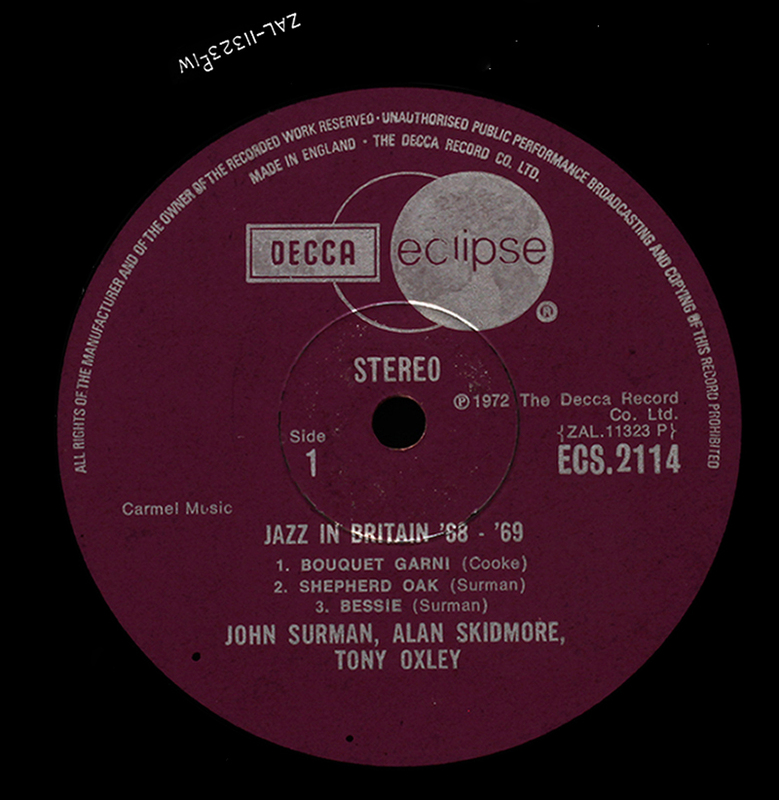 The label is renowned for its select roster of British jazz musicians of the late fifties. Original tapes were all subsequently lost, hence original pressings are very rare and as a result, impossibly expensive. 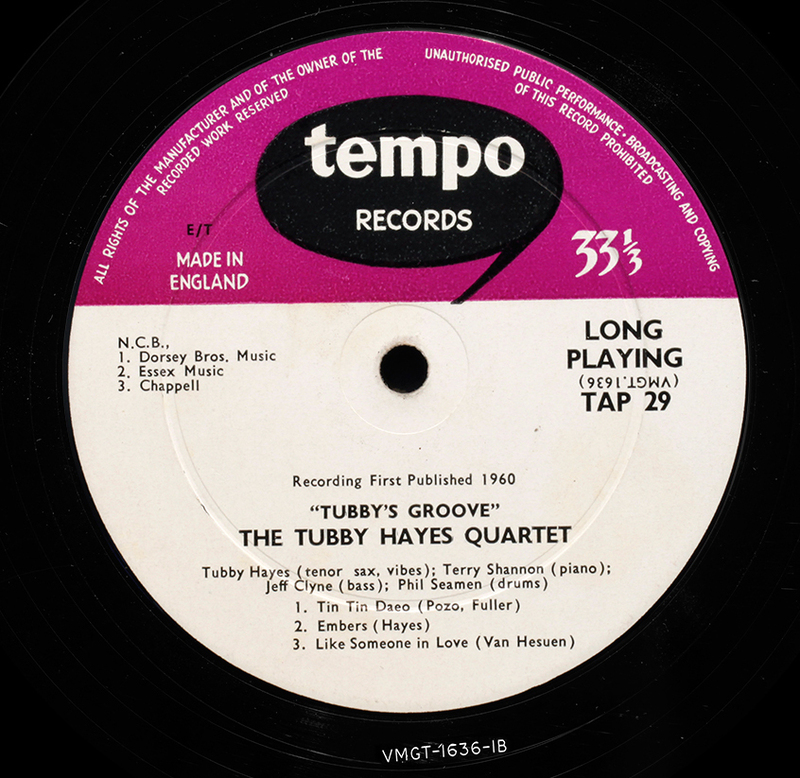 Famed silver/crimson “American Jazz Recording” label. 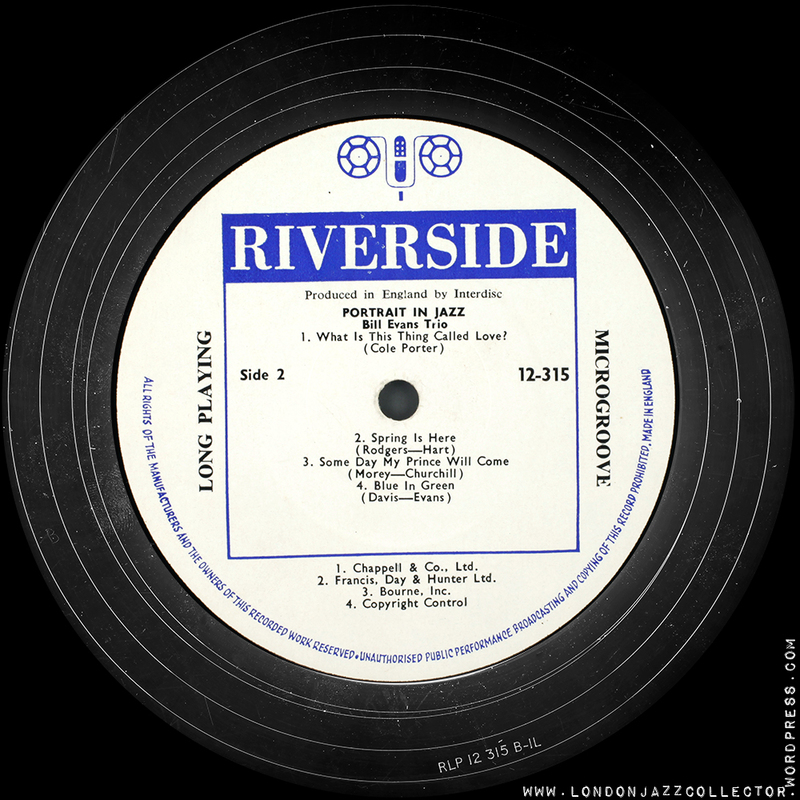 Decca’s main vehicle for licensing and releasing US recordings in the UK, with the original recording owner noted by the letter code after LTZ – in the case of this recording Riverside (U). Decca did love their codes. 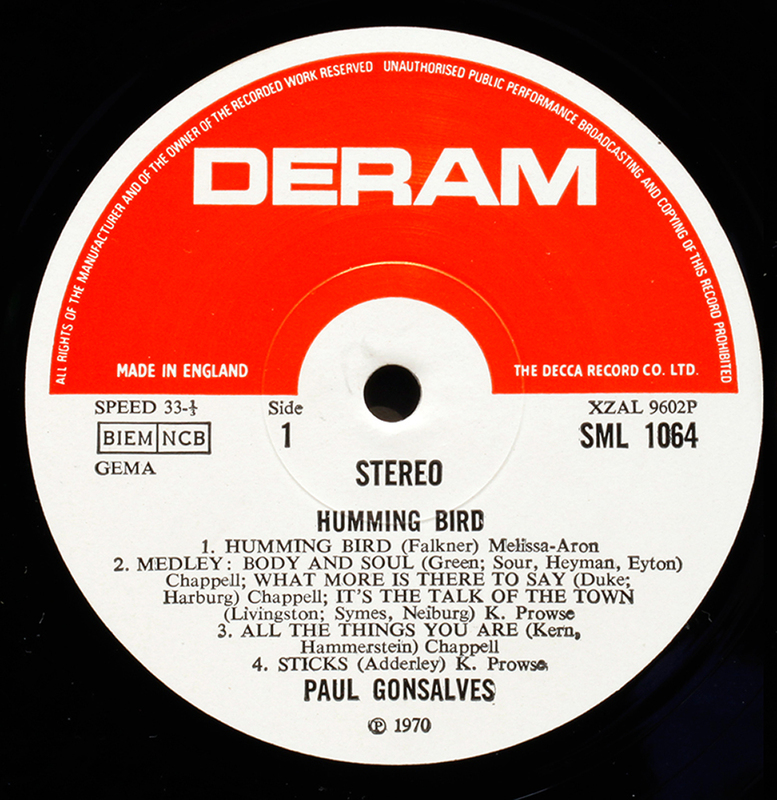 Decca’s “progressive” label launched to rival EMI’s Harvest label, well documented elsewhere by the archivists of rock and pop. A long-lived label which was the subject of various owners and many years of litigation. Example below shows UK Purchase Tax code “RT” in the run-out. 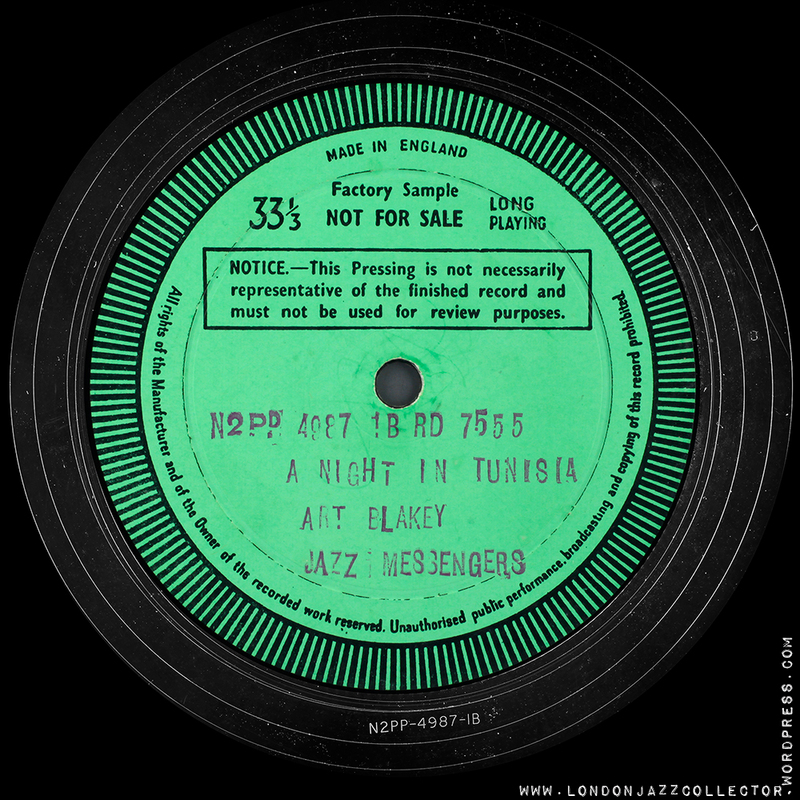 Product of the Decca Record Company Ltd – no warning, fake stereo! I only now discovered this most interesting Decca review. Regarding Felsted, I would like to add that Barclay titles from France were issued on UK Felsted (Chet Baker, Bernard Pfeiffer to name a few). The French label Ducretet Thomson was also issued in the UK by Decca, with the Zoot Sims album being the most prominent. Thank you for the prompt, Rudolf, this article is incomplete and needs to be revisited, especially the French Connection. I’ll get to it over coming weeks. Any photos would be helpful, as I don’t think I have any examples on my own shelf. The RCA Victor fake stereo is subject of a forthcoming post. Without giving too much away it’s regular mono on the left channel with a shadow mono on the right channel which has been electronically messed about with. Watch this space. You will be able to listen too. Apologies for piecemeal additions but just remembered all those RCA Victors are Decca pressings (Paul Desmond, a big chunk of 60’s Ellington). 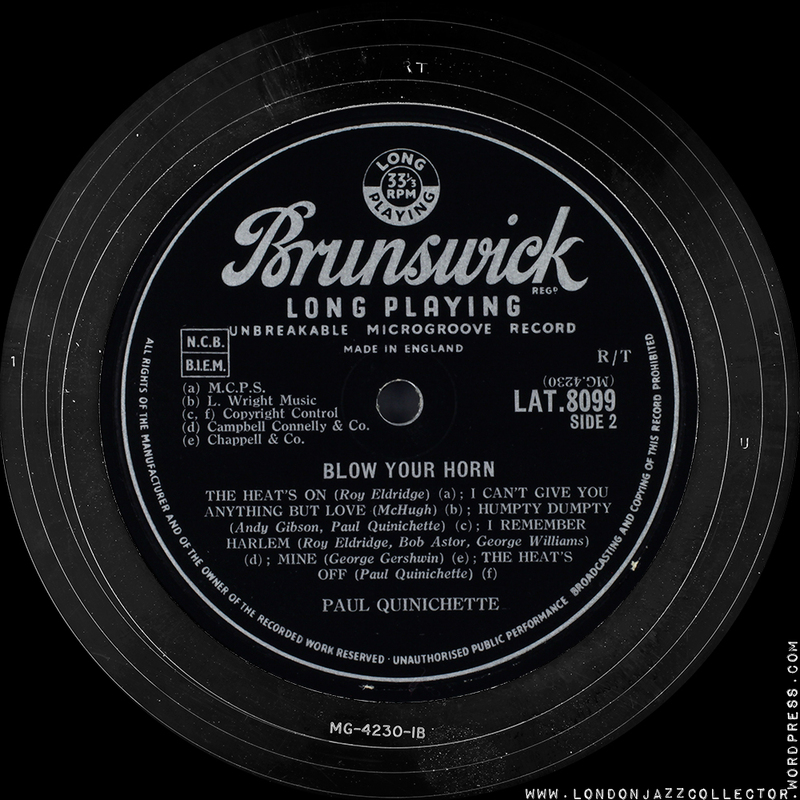 Brunswick, and Argo have to be added as there are some significant modern jazz items in their catalogues, I am thinking of the Michael Garrick stuff for instance. Thanks for the hint Mark! Luckily, the label-genie is in and I happen to have just the odd one of each of them, so additions for each you mention, complete with Decca’s friendly machine-stamp matrixes and engineer codes. However no Michael Garrick on my shelves. Well done, some great work. You can add the Vocallion & Esquires to your list, they are Decca pressings. I was looking at a 1957 jazz journal international advert the other day for Decca Family jazz lps. It listed a couple more; Coral and Vogue, although of course some later labels have vogue and Vocallion on them. Also of course, there are those lovely US Contemporary decca pressings from the sixties, they are beautifully recorded and sound phenomenal in the sixties Decca team masterings. Cheers Mark Harrington in Worcester UK. *re: pressings from the 1970s, when I started buying jazz records. Thanks for any input! Hello Ed in New York, sorry for the late reply, I like the Decca pressed contemporary lp sound a lot, but the US ones are lovely as well, on slightly noisier vinyl. There is not much else between them, but it is worth mentioning that the two are both far and away superior to later (70s or 80s?) pressings, as long as the older ones have not been played with a poor stylus. I just got hold of a 1970 Decca catalogue with every lp they issued in it. The sub family page has loads more labels than I remembered.